The history of the Nictaux United Baptist Church dates back to the latter half of the Eighteenth Century when the pastor of the "Church of Cornwallis and Horton" ministered to the numerous communities including Nictaux from 1760-1775. The first awakening came through the preaching of Henry Alline. Major Nathaniel Parker, who was attached to the army under General Wolfe and took part in the capture of Quebec in 1759, came to Nova Scotia in 1765 and settled in Nictaux. In 1799 he and his wife, Salome, traveled on horseback to Horton and were baptized by immersion. Thereafter, their home in Nictaux became a center for Baptists of the area Major Parker preached on several occasions. The first Baptist minister to settle in Nictaux was Rev. T.T. Chipman. He was baptized at Horton on November 5, 1779 and ordained in Annapolis County in 1782. The Church at Nictaux was organized on June 6, 1810 with Mr. Chipman as pastor Joseph Morton, David Randall and Isaac Whitman were appointed deacons, total membership 26. On June 24, 1811 the "Baptist Church of Nictaux and Wilmot" with membership of 58, requested admission into the N.S. Baptist Association, which was cheerfully granted. In 1813, a building committee composed of Obadiah Morse, Timothy Parker, Nathaniel Parker, Jr. Ezekiel Cleveland and Samuel Dodge designed and organized the construction of a Baptist chapel where the present church now stands. On June 27, 1816 the N.S. Baptist Association met in the new Chapel and the following day James Munro from Chester was ordained. Rev. Chipman continued to serve the Lord at Nictaux until 1828 when failing health forced him to resign. The only means of travel during Rev. Chipman's ministry was on horseback. Near the corner of the church may still be found the large stone used by women for a horseblock as they mounted the pillan behind the saddle of their husbands. A young pastor Rev. I.E. Bill came to Nictaux with his wife Isabella and son in December 1829. Rev. Bill saw many respond to the Lord's call. In 1829 the first Temperance Society in Nova Scotia was formed at Nictaux, in 1838 after much prayer the decision to found Acadia University was made. In May of 1832 24 gentlemen, including Pastor Bill signed a document which set forth the Creed, Articles of Belief, Covenant and Declaration of Land ownership of the "Regular Calvinistic Close Communion Baptist Church of Christ in Nictaux and Wilmot" which was recorded with the Provincial Registrar of Deeds, at Bridgetown on April 14, 1833. In 1845 was the beginning of another important work when a boarding school for young ladies was opened under the direction of Rev. Bill's daughter. This was the first of its kind in Nova Scotia. It was open until 185. In 1840 a new meeting house was built on the same corner which would seat 600. The old chapel was moved to a new location and was used as a school. On January 19, 1899 this large meeting house was completely destroyed by fire. By November, 1899 the congregation had erected the present building. This structure was renovated in 1955 to provide more Sunday School classrooms and has had extensive repairs both inside and outside since that time. A Carillon was dedicated on July 30, 1978 in memory of the late Arthur Nixon by his family. Nictaux is known as the "Mother Church" as it was comprised of an area extending from what is now the eastern boundary of Paradise to the western boundary of Berwick and from the Bay of Fundy Shore to the southern boundary of New Albany. In 1833 there were 1000 church members at Nictaux. As a division was made and two new churches were organized at New Albany and Aylesford, Lawrencetown Valley West and Inlisville asked for their dismission on April 8, 1873. In 1861 it was noted at Association to grant dismission to all members on the North side of Annapolis River. A new church was organized known as Pine Grove, now the United Baptist church at Middleton. In 1861 a new house of worship was built at Torbrook and in 1912 at Bloomington. In 1872 when M.P. Truman was pastor the people of Nictaux built their first parsonage. In 1896 a new one was built at Nictaux Falls. In 1964 a home was purchased at Nictaux and was used for a parsonage until 1972 when the new parsonage was built south of the church. 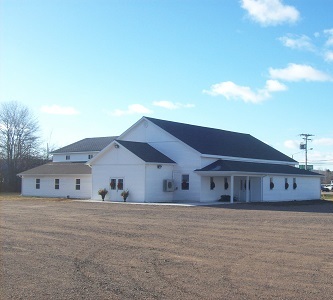 The congregation of the Nictaux Church has a history of ambitious moves in response to recognized needs and in April, 1976 construction was started on the Christian Family Centre which was officially opened on November 19, 1978, free of debt.